Suzn Quilts | Quilting my way through life! from the Ozark Piecemakers Quilt Guild in Springfield, MO last week. I first met many of these ladies at their guild’s quilt show last September. My daughter & I had a booth there selling my patterns. & unusual set-up for a quilt guild that I have ever encountered! They actually rent a storefront in a strip mall 365 days a year. Their membership is about 300.
one in the morning & another the same evening for their members that work during the day. They also have a lot of satellite clubs that meet at different times throughout the month; several charity sewing groups, a Featherweight sewing group, a modern sewing group & a group of strippers for heaven’s sake, lol! And that’s just a small sampling. I’m telling you, they have it all!!! They invited me to setup my goodies & speak to both groups. shown here behind Vicky’s Bonnie Hunter sew-along quilt. It’s huge with lots to see! I found this cool “hanger” for drying tops. The interesting part is that it’s adjustable. I’ll probably hang a quilt or two on it. I was also able to visit The Vintage Peddler. They have lots of lovely, thoughtfully displayed booths. including these HUGE display hangers. That’s a 30″ wide table that they’re hanging on. I showed these to some of my new quilt friends during our workshop the next day. Hang quilts on them of course! We laughed that I could hang all 12 of my Tiny Dresden quilts on the two of them; one from each clip. I also found this metal shelving unit that comes apart to store flat. whether for quilt shows or trunk shows & workshops like theirs. I will for sure be taking this to the Kansas City Quilt Festival in June. which is also being held in Kansas City this year. at least 1 ore more perfect little Dresden plates! Look at the smiles & the complete plates. Little do they know I love making them. I’ll make them for your group too if you invite me to teach a workshop. You can see my lecture & workshop offerings here. I hope you are all making more plates. Please send me pics when you do. It really is all about having the right tools for the right job. Do you need an excuse to sew a little green? If so, here’s a tiny inspiration! It’s just part of my Tiny Dresden Seasonal Series. A cute little quilt (6″ x 8″) that hangs conveniently on this adorable stand. to make a little sleeve so the quilt will hang perfectly. Once you have that quilt made you’ll want to make one for each month! A unique way to decorate a little corner of your or a loved one’s abode. including the patterns, stands, notions & fabric kits while they last. Doing my best to inspire you! 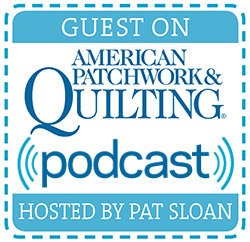 Thanks for all the kind comment about Strip Quilt Secrets! It was fun drawing a #. “I’m glad you are feeling better about scrap quilts! I hope you do make some quilts with all of those scraps. Now you’ll have no excuse not to. then make your own scrappy quilts. & do that little thing! The drawing will be tonight.